Sri Subbarama Dikshitar is the last of the Great Musician-Composer-Musicologist-Scholars of the Karnataka Sangita. His towering personality and scholarship stands far above any of his contemporaries. And, there is none equal to him even during the present times. He was the culmination of a long, historic and a chaste tradition of Indian Music that evolved over the centuries. Sri Subbarama Dikshithar combined in himself a great musicologist, historian, composer, and a great musician. His unique contribution is the composition of sancharis for all ragas figuring in Sangita Sampradaya Pradarshini. The whole world of Karnataka Sangita lovers, musicians, musicologist, scholars and everyone associated with Indian Music are greatly indebted to Sri Subbarama Dikshitar for his monumental Sangita-Sampradaya-Pradarshini and its associated works. But for his Great works into which he poured all his learning and knowledge, the accumulated wisdom of the centuries would have been lost to the modern age. Dr. V. Raghavan compares Sri Subbarama Dikshitar’s Sangita –Sampradaya-Pradarshini to a huge and permanent dam which impounded and preserved the music of the golden age of Karnataka music; and from which practicing musicians, theorists, editors and publishers of recent times have been continuously drawing inspiration and sustenance from it. Sri Subbarama Dikshitar was the inheritor of a distinguished and glorious tradition- Dikshitar Parampara – of Musician-Composer-Scholars. The three successive generations of the great composer-musicians of the Dikshitar Parampara are indeed like the pillars of Karnataka Sangita. The crest jewel in this Sarasvathi-kanta-abharana – that is the Dikshitar Parampara, was Sri Mutthuswamy Dikshitar (1775‑1835), one of the Trinities of Karnataka Sangita. He was the son of Sri Ramaswamy Dikshitar (1735 – 1817 A.D) who was proficient in the Lakshana (theory) and Lakshya (practice) of Karnataka Sangita. The popular Raga Hamsadhwani with which the concerts invariably takeoff (after the Varna) and which has also become a regular part of repertoire of Hindustani Music is said to be the creation of Sri Ramaswamy Dikshitar. He is also credited with large number of Tana-varnas, Pada-varnas, Darus, Raga-malikas and Kirtanas. His Raga-malika in 108 ragas and Taalas (Ashtottara Satha Raga Taala Malika) is an icon of his versatility and creative genius. After Mutthuswamy, two sons – Chinnaswamy and Baluswamy–and a daughter Balambika were born to Sri Ramaswamy Dikshitar. All were accomplished musicians. Chinnaswamy Dikshitar (1778-1823) the second son of Sri Ramaswamy Dikshitar was, in his own right, a gifted musician and composer. His two Kritis composed in honor of Sage Narada: Ganalola karunalavala (in Todi) and Narayanananti (in Kalyani) are well known. The first line of the Pallavi Ganalola karunalavala, and the Anupallavi manita guna sujnana dhurina were popularly sung in Raga-Tana-Pallavi rendering during the early parts of the 20th century. Chinnaswamy is said to have created Sanchari phrases for many Ragas; and also used diverse Taalas like Dhruva, Triputa, Adi, Matya and Ragana Matya in his compositions. Sadly; Chinnaswamy died quite young at the age of 45 while on a pilgrimage to Madurai. The youngest of the three brothers was Baluswamy Dikshitar (1786‑1858). He was younger to Sri Mutthuswamy Dikshitar by nearly about ten years. Since his illustrious elder brothers had taken to Veena, Vocal music and composing, Baluswamy decided to try something different and new. At the suggestion of the Dubash Venkatakrishna Mudaliar who was their family friend and patron, Baluswamy started learning to play on the western instrument – Violin – that was just getting popular in Madras. Venkatakrishna Mudaliar appointed a European tutor to teach Baluswamy. Within about three years, Baluswamy became an accomplished violinist. It was his genius that adopted the western instrument Violin to Karnataka Sangita. He soon started accompanying, on violin, his elder brother Mutthuswamy who played Veena. Thus, what started as a jest or an experiment, in due time, became a regular feature of the Karnataka Sangita. Now, it is hard to imagine a Karnataka Music concert without its most visible and audible element, the violin , accompanying the main singer. Sri Subbarama Dikshitar (1839-1906) comes in as the fruit or the culmination of the distinguished Dikshitar Parampara. He was born in Tiruvarur in 1839 (i.e. 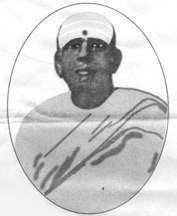 four years after the demise of Sri Mutthuswamy Dikshitar) as the second son of Shivarama Iyer and Annapurni who was Baluswamy Dikshitar’s youngest daughter. With the name’ Balasubrahmanya Sarma ´, I am the son of Balasvami Dıksiita, the youngest brother of Muddusvami Dıksita. Balasvami Dıksita’s youngest daughter’s name was Annapurniamma. Her husband was Sivaramayya who belonged to Bharadvaja Gotra, and Drahyayana Sutra. Ramaswami Ayya, who was his first son, was very talented in music and Veena was felicitated by kings and attained heavenly abode at the age of 45. And, Ramasvami Ayya had two sons, Veena Cinnasvami; and, the other was the third principal of the Maharaja’s High School and musical connoisseur, Venkatarama. I was born as the second son (of Sivaramayya and Annapurniamma) in Tiruvarur in the Saka year 1761 (1839 A.D.) during the year of Vilambi, Tula Rasi, and Hasta Nakshatra. None of the three brothers – Mutthuswamy, Chinnaswamy nor Baluswamy – had a male child. On the advice of Kumara Ettappa Maharaja of Ettayapuram, who was their patron, Baluswamy adopted Subbarama the second son of his daughter Annapurni as his son. When Subbarama was adopted and brought to Ettayapuram he was just a lad of five years. Baluswamy, under the patronage of the Maharaja, arranged for the education of Subbarama in Sanskrit (Vyakarana, kavya, Alamkara), Telugu, Music and Veena. Subbarama was a bright young boy eager to learn; and, by the age of 17 he was just flowering into a talented musician and composer. “When I was only seventeen, I composed a Tana Varna in Darbar and when it was presented before the King, some in the assembly thought that my father had actually composed it. The King, therefore, told me, ‘I am going out and shall come back in one hour; by that time you should sit here, compose and keep ready for me a Jati-svara in Yamuna Kalyani. and , the King specified that in the Jati-svara, after Pallavi and Anu-pallavi, there should be a Svara-passage starting on Dha, and the next Svara-passage should be set in three tempos fast (druta), medium (madhyama) and slow (Vilamba) , and again in the same three in reverse order, and then the Muttayisvara. The King, to test my ability ordered that I should not, while composing the piece, leave the spot; and , he also set two guards to watch me. I finished the Jati-svara in the given format before the scheduled time. And , the King, after listening to it, himself took me to my father, announced the new composition, made me sing my new composition and rewarded me with a pair of shawls and ten sovereigns’’. “For Jagadvira Rama Eddappa Maharajah, I composed two Chowka -varnas for dance in Anandabhairavi and Surati; and a Raga-malika in nine Ragas. And, in the distinguished Sadsas (gathering) that included His Holiness Sri Sankaracharya of Kamakoti Pitha, Veena Subbukutti Iyer, Tirumalarayampattanam Ramudu Bhagavatar, Tirukkadayur Bharati (a direct pupil of Mutthuswamy Dikshitar) and Vidvans in different Shastras, I sang a Tana-varna in Ramakriya and the Kriti Sankaracharyam in Sankarabharana*”. 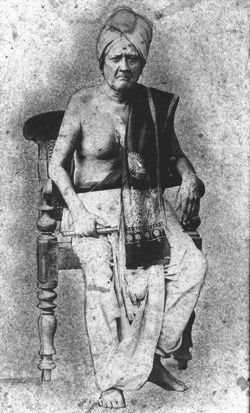 In his nineteenth year (1858), Subbarama Dikshita was appointed Asthana Vidwan of Ettayapuram, succeeding his foster-father Baluswamy Dikshitar who just had passed away. Sri Subbarama Dikshitar led a busy and academically rich life at Ettayapuram. Sri Subbarama Dikshitar gained fame as a musician and a composer (Vak-geya-kara). Though later in his life Sri Subbarama Dikshitar gained fame as a Lakshanakara, his contributions as a Vaggeyakara are also significant. While basically adhering to the style of Sri Mutthuswamy Dikshitar , Sri Subbarama Dikshitar displayed a great versatility , and produced not only kritis but also many Tanas, Chowka and Pada Varnas, Svarajatis, Raga-malikas and Darus with liberal Svarakshara passages and alliterations. He composed the music for some of Krishnasamayya’s (another artist attached to the Court) lyrics. In his description of one of Krishnasamayya’s kritis, Devi divya nama in the Raga Mechabauli, he mentions that the music for it was composed by him. Sri Subbarama Dikshitar also set to music, the Valli-Bharatam, a Tamil composition by Kadigai Namassivaya Pulavar of the Ettayapuram Court. And, he set another composition, Ma -moha -lahiri in Khamas by the same Tamil scholar to dance-music, similar to famous Useni Svarajati. It is printed in the Sangita Sampradaya Pradarshini. He also did a Tamil translation of the Telugu Mahabharata. His writings and compositions were generally in Telugu language. The body of his known Musical creations include Eight Kritis ( two in Bhairavi, two in Shankarabharanam; and one each in Sriranjani ,Yadukula kambodhi , Natakuranji , and Kalyani ); Seven Raga-malikas ( of these four are in praise of the King ); Twelve Varnams (four Tana-varnams, three Chowka Varnams and five Pada varnams ); and two Darus. Most of his compositions are set in Rupaka Taala or Tisra Eka Taala. Poetic excellence and musical prowess are the hallmark of his compositions. Some of his exquisite Varnams gained popularity. For instance; his Chowka Varnam in Raga Surati beautifully portrays the Raga-bhava with its delicate prayogas and Gamakas. In this Varnam, the Sahitya (meaningful words) succeeds the Charana; and the Varnam concludes with the Pallavi. [Pada Varnams used for dance choreography are also called as Chowka Varnams or Ata Varnams. They usually are set in slower tempo (Chowka kalam) ; and, have longer lines and pauses, enabling apt portrayal of the Bhava of the Varnam . All its Svaras are accompanied by Sahitya (lyrics) and Sollukattus which are made up of rhythmic syllables. The dancer performs the Sahitya in Abhinaya and the Sollukattus in Nritta. Chowka Varnams, are, thus, well suited to dance. Somehow very few of his Kritis are rendered in the concerts. V. Subramanyam (in Shanmuka Jan-Mar 2008) wonders that might be because his compositions are tightly knit and sophisticated; their musical content is hard to assimilate and to bring out the nuances and Sancharas effectively; and, they do demand Sangita jnana. Sri Subbarama Dikshitar in his Sangita-prachina-paddathi outlines the Guna–Dosha (merits and shortcomings) of a Vak-geya-kara, the composer who sets his lyrics to music. According to him, the composer of a traditional Karnataka Sangita Kritis that satisfy the norms and requirements as laid out in the Lakshana Granthas: should be endowed with sharp intellect; should possess thorough knowledge of Vyakarana, use of various types Vibhakthis and Chhandas; should have the gift of dexterous use of words , the ability to bring out various shades of their meaning picturesquely ; should have an insight into dance and other art forms; and, necessary have the sense and understanding of the Rasas. At the same time, he cautions that a Composer should keep aside professional jealousy, prejudices and rivalry while working. He should have a sense of balance and keep his mind open to alternate views and opinions. And yet; he should have the ability to establish his stand in the gathering of the learned (Sadas). Sri Subbarama Dikshitar was indeed a repository of all such virtues and merits. Unlike in the case of Sri Tygaraja, the main line of disciples (Shishya-parampara) in the Dikshitar tradition (Dikshitar-parampara) is represented by its family members. Sri Ramaswamy Dikshitar was followed by his famous son Sri Mutthuswamy Dikshitar. And, Sri Mutthuswamy Dikshitar was followed by his brother Baluswamy Dikshitar who in turn was followed by his son Subbarama Dikshitar. Sri Subbarama Dikshitar was followed by his son whom he named him as Mutthuswamy Dikshitar (who later gained fame as Ambi Dikshitar). And, Ambi Dikshitar was followed by his son Tiruvarur Baluswami Dikshitar. Ambi Dikshitar (1863-1936) who succeeded Sri Subbarama Dikshitar as the Asthana Vidwan (court musician) at Ettayapuram, stayed there for a long time. Later, he migrated to Madras where he lived for the rest of his life. While in Madras, Ambi Dikshitar gathered around him a circle of disciples, scholars and admirers. Ambi Dikshitar made his life mission to preserve and propagate the Kritis of Sri Mutthuswamy Dikshitar in their pristine purity. In his efforts, he was ably aided by Justice T. L. Venkatrama Iyer; brothers Tirunelveli, Anatakrishrna Iyer and Sundaram Iyer; and others. Ambi Dikshitar initiated and guided Smt. D. K. Pattammal in singing Dikshitar’s Kritis. He was also the teacher of the renowned musician – Artist Shri S. Rajam who popularized rendering of Dikshitar’s Kritis over All India radio Madras. Shri Rajam also presented pictorial representations of many of Dikshitar’s Kritis. Dr. V Raghavan describes in detail the course of events that led to Sri Subbarama Dikshitar writing the major work of his life [Collected Writings on Indian Music by Dr. V. Raghavan, Vol.III. P.87-95]. Here is a summary of that. Sri A.M.Chinnaswāmi Mudaliyā , a Superintendent at that time in the Madras Government Secretariat, a Roman Catholic Christian with a consuming passion for Karnataka music, having started on his gigantic project of presenting Oriental Music in European Notation, sought out representatives of the direct Shishya-parampara of Tyagaraja like Walajahpet Krishnaswami Bhagavatar and wrote out 800 pieces of Tyagaraja and other composers in Staff Notation, checking his scripts with the aid of violinists trained in Western music who were asked to play them by sight. Though this journal was praised by many, the response was meager and Chinnaswamy Mudaliar had to discontinue its publication. During this period (1895) , A.M.Chinnaswāmi Mudaliyār , with his eyesight failing after years of notating and casting types, began corresponding with Sri Subbarama Dikshitar , who was then serving as the Asthana Vidwan at the Court of Ettayapuram , known for its patronage of arts. He also came into contact with Sri Subbarama Dikshitar and the Rajah of Ettayapuram. This relationship proved very significant, as it culminated in the publication of the Sangita Sampradaya Pradarshini in the year 1904, with the patronage of the Rajah of Ettayapuram. But, sadly, Sri Chinnaswamy Mudaliar passed away before the Book was published. For a detailed study on the life and works of Sri Chinnaswamy Mudaliar ; as also on the notation system developed by him for the Karnataka Samgita , please do read the research paper produced by Smt. Aishwarya Shankar . Please check here. With the intention of making music as language, A. M. Cinnasami Mudaliyar , M.A. started writing a book called ‘Pracına Gana ‘, in English notation, in the year 1895; and, was trying to publish it. At that time, he came to know about me, brought to me the work he was doing. I mentioned to him the details of the Gamakas and other features of the Venkatamakhi’s system of music. I suggested to him that it would be useful to publish the Kritis of Carnatic music using the staff notations , to bring out their characteristic shades and Bhavas. Between the years 1895 and 1899 , Sri Subbarama Dikshitar made several trips to Madras to stay with Chinnaswamy Mudaliar and teach him the compositions of Sri Mutthuswamy Dikshitar and confirming the corrections of Chinnaswamy Mudaliar’s staff notations. By about 1899, Chinnaswamy Mudaliar was finding it very difficult to carry out the printing and publication of these works, because of his failing eyesight. He therefore visited Ettayapuram and personally appealed to all those who mattered, including the Rajah himself, and convinced them the need for the Ettayapuram Samsthanam to take up the task of completing his mission and to ensure publication of his compilation. He also urged that Subbarama Dikshitar should be allowed to help in finalizing the notations for the entire music of the Dikshitar School. Sri Subbarama Dikshitar himself records that he would not have undertaken the huge task but for the appeals and insistence of Sri Chinnaswami Mudaliar. In the year 1901, Subbarama Dikshitar at the age of 60 began working on the Sangita Sampradaya Pradarshini. It is truly a work of great love and intense dedication for the subject of Music. It reflects the depth of learning and artistic wisdom of Sri Dikshitar. Besides the original musical works (Varnas, Kritis, Raga-malikas, Darus etc) which Sri Subbarama Dikshitar himself composed , the explanatory notes he offers on the Raga-lakshanas, that illustrate the unique characteristic Svara phrases of each Raga, he adds elaborate Sanchari phrases that help in understanding the structure of the Raga. An important aspect of this Book is the use of Gamaka signs in the notation that help in defining minute details in the musical structure of the composition. The explanations on how the Gamaka signs are to be interpreted and rendered in vocal and instrumental music are also given. This method of notation, aimed at reflecting the form of the song as it would be sung, has helped to retain the compositions in their original form, ensuring some uniformity and authenticity in the way they are rendered. And, it is through his monumental work that we know about many compositions of Vaggeyakaras before and during his time. His Book, an encyclopedia of musicology, is indeed a treasure house. Before the task got underway, Sri Chinnaswami Mudaliar made an appeal to Sri Subbarama Dikshitar that he should put down in writing notations and everything that he knew without holding back anything for any reason. Sri Dikshitar agreed to that. True to his word, he unselfishly poured out his entire learning and knowledge into the Great Book the Sangita Sampradaya Pradarshini. Sri Subbarama Dikshitar worked on Sangita Sampradaya Pradarshini for more than four years. Its printing began towards the latter part of 1901 ; and , just as the work was in progress, Sri Chinnaswamy Mudaliar sadly passed away in December 1901. Thanks to the continued patronage of the Rajah, the Sangita Sampradaya Pradarshini was completed in the middle of 1904, after four years of hard work. Its types for Telugu and for the Gamaka-signs were ordered and specially made. The credit for having printed this very difficult material at a time when printing in this country was in its infancy goes to Sri T. Ramachandra Iyengar and the Vidya Vilasini Press at Ettayapuram. The book was published under the authority of Rao Bahadur K. Jagannathan Chettiar, Secretary of the Ettayapuram Samsthanam. It was doubtless one of the most authentic documenters of Indian music and musicology. In his work, Sri Subbarama Dikshitar acknowledged the assistance he got from the Principal of Maharaja’s College in Pudukottai, Sri S. Radhakrishna Iyer, for his research on the Lakshanas, drawing material from various early works on musicology. The Sangita Sampradaya Pradarsini was published in 1906, in two volumes running into 1770 pages. In 1905, his book Prathama-abhyasa Pustakamu was published. This included early lessons in music as well as some Kritis. It contains both theoretical and practical aspects of elementary teaching methods; and is relevant to the music field even to this day. In this book Sri Subbarama Dikshitar included thirty-two compositions, under the title Nottaswara Sahithyamu with Svara notation, as technical compositions for beginners (Abhyasagana). In 1906, the book Samskritantara Dravida Keertana with tunes he composed for Krishnasamayya’s sahitya was brought out. Later, Sri Subbarama Dikshitar intended to bring out the Collected Edition of the compositions of Sri Tyagaraja, the Kritis of Syama Shastry and the Padams of Kshetrayya. But, before his dream could be realised, death snatched him in the year 1906, when he was just about 67 years of age. The monumental work contains the biographies of 77 musicologists and musicians right from the time of Sarangadeva to those of Subbarama Dikshitar himself, as also the biographies of some Ettayapuram rulers. There is also an exhaustive tabular statement of Raganga, Upanga and Bhashanga Ragas with their Murchanas; 170 Gitas of Venkatamakhin ; 10 Prabandhas ; 41 Chittai-tanas of Venkatamakhin; some Raga-malikas, Suladis, Svarajatis, Varnas, Darus, and Padas — all numbering about one hundred. The 72 Melas and their Janyas, with Raga-lakshanas, explanations, illustrative Lakshana-Gitas and Sancharas are also given. Sri Subbarama Dikshitar introduced symbols for the15 Gamakas of Karnataka Sangita, perhaps based on his discussions with Sri Chinnaswamy Mudaliar. Some compositions of Sri Tyagaraja and Shyama Sastri, besides 229 of Sri Muthuswami Dikshitar also find place. In addition to two volumes of the main work Subbarama Dikshitar also brought out Prathama Abhyasa Pustakam of 230 pages meant for the beginners. Thus, the Sangita Sampradaya Pradarshini is a singularly valuable resource for understanding the traditions of Karnataka Sangita and of Sri Muttuswami Dikshitar in particular. In order to celebrate the 100 years of its publication in 1904, an English translation was undertaken by Dr.P.P. Narayanaswami and Dr. Vidya S Jayaraman along with a team of volunteer proofreaders. An English Web-edition has also been brought out. The English Web-edition is based on the original Telugu version and includes all the Gamaka symbols (ornamentation) and Svara notations as given in the original Edition. The Vaggeyakara Caritamu, the biographical accounts of Composers, is also given. For the Web-edition of Sangita Sampradaya Pradarshini, please check the following link. We all owe a great debt of gratitude to Sri Subbarama Dikshitar, Sri Chinnaswamy Mudaliar, The Samsthanam of Ettiyapuram and its printers for this magnificent work. The efforts of the translators (into English) and their teams are truly commendable. [ For a detailed study of the Life and works of Sri Subbarama Dikshitar, please do read the Doctor Thesis submitted to the University of Kerala by Dr. Smt. R K Dhanya, during the year 2013. V Subramanian, Shanmuka Jan-Mar 2008 Subbarama Dikshitar Vaggeyakara. The pictures are taken from Internet.